Thank you for all you and your team’s work to make last night’s holiday party such a success. The room looked beautiful – and everyone had a BLAST striking a pose at the photo station and with Matt and you at the DJ booth. It was truly a special evening – One that our employees will remember for a long time. Hope to see you, and work with you again soon! Kristina S. Director of Communications and Strategic Events. Hi Marcia & Derek The photos are absolutely amazing. It captures the entire night so perfectly and you and Rory did such an amazing job! Derek and Mike rocked the party, what an amazing night Thank you!!!!!! Joe and Marcia, Where do we begin. Words can't even explain how amazing your company is as a whole. The years of hard work you both put into your business truly shines. The personalities, professionalism and pure talent is just a few words to begin to explain what Groove Entertainment has to offer. Joe & Marcia we personally want to thank both of you. You went completely above and beyond to make our wedding day special. we felt like celebrities! From the minute you arrived on site we knew we could sit back, relax and enjoy. Our friends and family can't say enough about the entertainment you provided us on 8.26.11. You were such an influence in making our wedding day a success and we will never forget that. You have created memories to last a lifetime and we want you to know how much that means to us. It wouldn't have been the same without Groove Entertainment running the show. Thank you so much for all your hard work and we are truly blessed to have meat such great people. Warm Wishes, Lauren and Parker Harrington. My husband and I got married on October 21, 2016 in Nahant. We had Derek Campbell DJ our wedding. He was the best choice we've made. Derek was very personable and extremely professional. He played a variety of music through out the night for all age groups. We would definitely recommend him to anyone looking for a DJ. He was very organized and made sure he had all of the details correct and made sure we didn't miss anything. It was truly an amazing night of keeping everyone energized and on the dance floor and we have Derek to thank for it. We worked with Graeme Ritchie for our wedding and could not have been more pleased with everything he did to make our wedding so wonderful! Graeme was easy to get in touch with and spent some time asking the right kinds of questions, but it was clear he knew what he was talking about, and didn't need a ton of direction. We sent him some songs and artists we liked, the kind of music we wanted played when throughout the night, and left a lot up to him. Day-of, Graeme was great - fairly hands-off but it was clear that he was on-top of everything that needed to happen and when it needed to happen. The music was amazing - really spot on at every moment of the evening, from the ceremony (which we did pick out which songs we wanted) to the dinner and dancing. Graeme's shining moments were during the dancing portion of the event. People loved the music and the dance floor was packed all night. Since the wedding, multiple people have commented how much fun they had dancing and how good the DJ was - and we agree! As a note, my wife and I are both women and it was a lesbian wedding. Graeme was just generally easy to work with around this and was welcoming, warm and, most importantly, a great DJ! 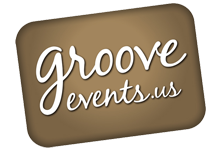 "GROOVE EVENTS EXCEEDED ALL OUR EXPECTATIONS.